Will it? Won't it? Could it? Would it? Between discussions about the weather, the event, the swim etc the overriding agreement was that 2012 had to be a good year to ensure that the Ironman 70.3 Galway event would get the crowds for 2013. After the shortened swim of 2011, many were despondent that the course was short, there were complaints about the food, the organisation, the weather, the roads... fine there shouldn't have been organisational difficulties (sure who gets anything 100% first time? ) but the conditions are what is part of making Ironman 70.3 Galway unique in its own way. I won't bore you with details of the training that got me back to the start line of 2012, my blog has been pretty sparse through the summer as life has been busy. Suffice to say I have been more consistent in my training, better at resisting crap in my diet (mostly) and more focused. I raced a few sprint and Olympic races through the season, mostly in an attempt to qualify for the age group championships in 2013 but also to feature as part of my training regime. In the six weeks run into the 70.3 this year I did a proper build phase with plenty of tempo sessions on the bike & run. I also started running off the bike, properly. Pay back for the work became evident in my taper week. I was doing easy runs and felt like I had to fight to hold back, the old greyhound busting at the trapdoor syndrome. My last bike before race day was with Paul Hawkins, the UK pro who was staying with us via Homestay. That was great, cycling with a pro athlete & being comfortable with a strong pace (easy for him!). I spent Thursday, Friday & Saturday with Paul, doing the last few easy sessions. Doing a recce of the bike course and showing our guest around I got to meet some of the pro triathletes that would be racing the 70.3 and after registration, sat in on the Pro race briefing. One of those experiences that's just nice to be able to do as its highly unlikely that I would ever get to be a Pro triathlete, nice to dream. Early to bed Saturday with the Devil's weather outside and up at 4.30 on Sunday morning to perfect conditions. All the weather doubters!! You could not ask for a more perfect day. Breakfast was porridge with brown sugar, a coffee and away we went. Traffic & parking was a doddle at that hour, we got the van right up beside the swim start which proved very handy for me, no gear to lug around. 10mins walk to transition, visualising the swim exit along the way and it was time to check the bikes (left overnight) pump the tyres and set up feed, bottles and spares ready for the off. Popped over to Paul to wish him all the best and then waited in transition for a short while for Damo. 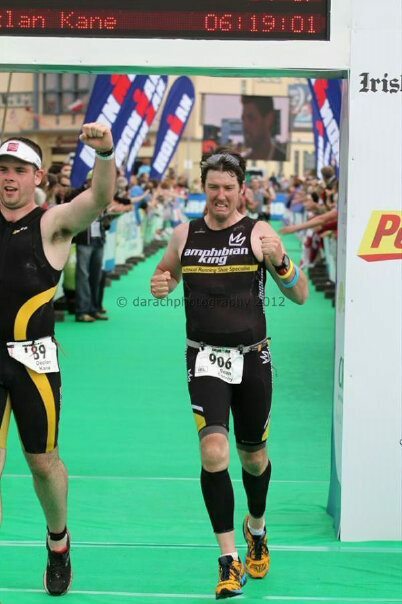 I had Powerbar energy bars for him as Mr Preparation himself landed with just x2 Mars bars for his race. Also a bit of banter with Chris Hewings and a side bet that may include a forfeit of his Kask aero helmet. I also had an opportunity to grab a quick photo with Gavin Noble and Kevin Thornton while we were getting organised. Time was ticking, so leave the bike head down to the swim start to see the pros heading off in the dawn light. I was not due to start until 7:50 so a bit of time to get organised and changed. The advantage of parking where I did, meant I had somewhere comfortable to get changed. The downside was everyone thought it was the van to drop the white bags at!! Plenty of pre-race chat with all the boys, everyone wishing each other good luck (as expected) and zipping each other up. Into my wetsuit and down to the water's edge to watch all the waves going off. We got the 10 minute warning and headed into the pen to be counted into the water and then we were in. Quick warm up, 'seal' the wetsuit and ready for the starting hooter. The hooter went and away we thrashed. 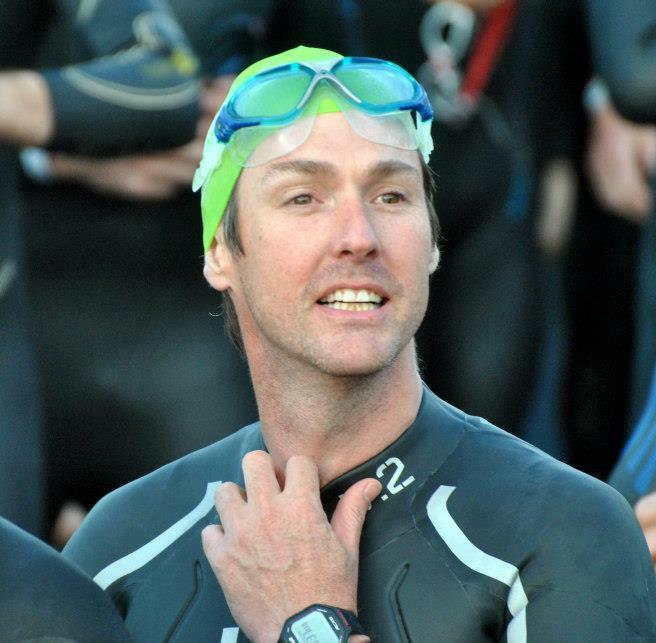 I had placed myself mid pack as I've found myself increasingly comfortable and confident with my swim ability. It was all about holding your own position and getting to the first buoy as cleanly as possible. This was approx 200m straight out into the bay. Plenty of barging and pushing going on but you just have to ride out this storm and find your rhythm. I somehow managed clean water at the buoy and a swift 90 degree turn meant we were now parallel to the shore. Landmark was easy, the sun had just come up on the horizon so all we had to do was swim straight to the bright light in the sky. I settled quickly into a decent rhythm and confidently caught some of the lads that went off like hares. There was plenty of zig zagging going on and i had to hold my position against one or two 'surgers'. (Surgers - are my word for those who put the head down, swim like fury, all over the place, stop, look up, correct and go again extremely annoying when they surge across you). Swimming strongly (for me) with a good rhythm, in a straight line is what I set out to do and I was happy doing it. It seemed to take forever to hit the turning point then it was a 180 degree turn back up parallel to the prom and heading for the exit. I got the distinct feeling that we were now catching a current which probably explains the slower times. Exiting the water, forget the wetsuit, get up the ramp onto the flat and fiddle with the zip on the run into transition. Up the ramp along the green carpet and through the park to the tent. Collect the blue bag. Wetsuit, hat & goggles into bag, helmet out and on. Hand bag to young volunteer: 'Thanks!' out the door and around to the bike rack. Collect bike and away to the exit. Smooth & efficient. Exiting the park by the side gate and running down the hill in barefeet wasn't nice. But jumping onto the bike at the mount line, smoothly, and powering off down the road was great! "I've trained for this, so nail it", my inner voice said. Looked for and found my groove readily and settled into picking people off steadily. My strategy was simple. Hit the bike steady, don't surge and keep drinking. I was on High5 4:1. I've trained with the carb:protein mix and find it works well for me in the endurance stuff. I'd x4 gels for the bike (GU Mint Choc, nom! nom!) and x3 bottles of the 4:1. There was a fair bit of drafting going on and it bugs the sh1t out of me. One lad blatantly kept jumping onto my wheel. He'd creep past on the hills, so I'd to sit up and drop back 10m before going at him again and then he'd sit in again! A couple of snot rockets gave him the message. Anyway, back to the bet. No sign of Mr Hewings coming past me by Oughterard on the way out (I didn't expect it anyway) by Maum Cross, still no sign and when I steamed through Oughterard on the way back I knew I had turned the betting tables and was €100 up (or in my mind a Kask Aero). 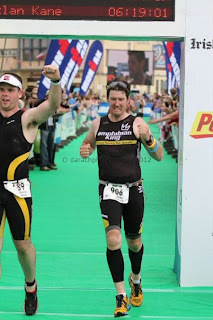 He eventually caught me somewhere after Moycullen and rather ruefully rolled on through to the finish. I came in strong and got ready for the dismount. 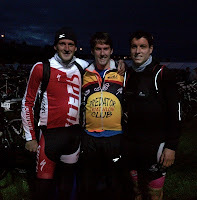 Bike time 02:42:29, 37 in AG, 269 Overall. APace 33.23km/h. Easy. Dismount the bike, run into transition (shoes still on bike), rack the bike & into the tent. Collect red bag. Shoes & socks out of bag, helmet into bag and hand back to volunteer. Socks & shoes on and laced up while the lad next to me is still fiddling with lock laces. (Beauty of tying laces for a living :) ) Out the tent, down the ramp on the prom. The first thing that hit me was a wave of sound from the spectators along the whole length of the prom. Second was the merging with existing runners on the course, not knowing where people were in respect of loops and so not having someone to pace off. I was happy enough with the run, I'd dialled the pace into the legs over the previous weeks. I knew I should be capable of running around 5:00 min/km off the bike, I knew I'd prepared for the run properly, fed well on the bike and was ready to go. Friends and family, Edel & the kids were all spread along the route. There were so many people who I recognised as I ran past, Paul, Val, John, Adrian, Grace, Brian and so many more that I didn't spot in the crowds (in fairness I didn't spot Paul, I just heard him!!) but all were shouting for me. This encouragement drives you on and I was conscious to tap into it but to control it so pace didn't go out the window. In the end I did struggle. I went out a little too comfortable, hit the first turn and realised the full force of the wind was going to be in our faces all the way back, so half of each loop with the wind, half against. My nutrition strategy was simple, water & coke on the run with a gel in the middle. I'd enough on the bike & have been well used to running tempo in fasted state with not food or water. The wind got stronger with each lap and I can remember Gavin Noble shouting me on on the second lap, reminding me to use the wind when it was with me. Amazing feeling, an Olympian shouting encouragement at little old me!! A memory forever. Each loop brought me closer to the end and while my pace went out a bit I was very happy to bring it all home and to pass people in the final 300m run in to the line. It's only a little thing but that fast finish brought me up 6 or 7 places overall. All in all delighted with the result. 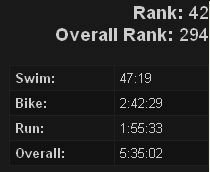 A full 18 mins off my previous bike time and 16 mins off the 70.3 run from 2011. Swim can't be considered as it was shorter last year. Great read! Had a good laugh at your snot rockets :) What age category are you in if you don't mind me asking? Hi Keith, I'm in the 40-44. Sorry if I got you with those snot rockets! Sick & tired of people on the wheel blatantly drafting.